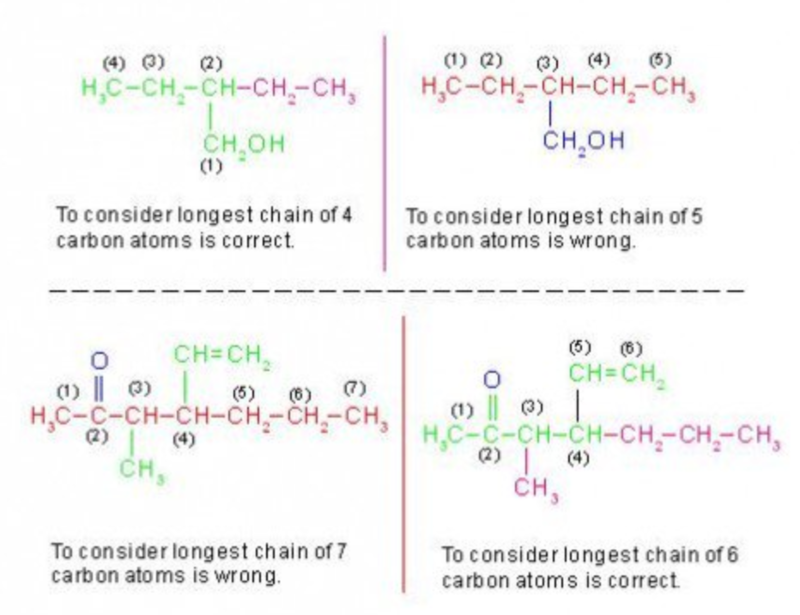 (1) Parent chain : Select the longest possible chain of carbon atoms containing the functional group and the maximum number of multiple bonds as the parent chain without caring whether it also denotes the longest possible carbon chain or not. Number the parent chain in such a way that the functional group gets the lowest locant, even if it violates the lowest set of locant rule for substituents. (3) If the parent chain in addition to the functional group also contains a double or triple bond or both , the locants for the multiple bonds are automatically fixed once lowest locant is assigned to the functional group. 4) If both double and triple bond do not form a part of the parent chain, then the lowest locant is assigned to either the double or the triple bond which ever is nearer to the functional group. 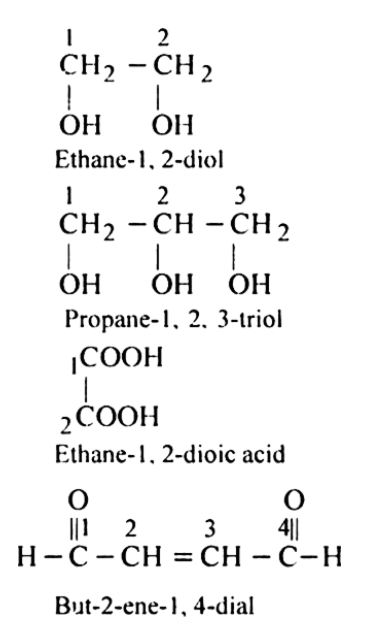 5) Numbering the chain terminating functional group: When a chain terminating functional group such as -CHO , -COOH,-COOR , -CONH2 , -COCl, -CN etc is present , it is always given number 1 and number 1 is usually omitted from the final name of the compound when there is no ambiguity. 6) If the compound contains two or more like functional groups , the numerical prefixes di, tri , tetra are used and the terminal e from the primary suffix is retained while writing the IUPAC name.